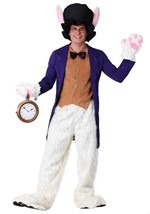 Make your Halloween a little wacky with this deluxe authentic Mad Hatter costume! This detailed outfit looks just like the one seen in Tim Burton's Alice in Wonderland film. The burgundy jacket is made of polyester and features many details, including real, seashell buttons, fur and lace trimmed sleeve cuffs, and a lined interior. The faux pockets on the front have an attached pink scarf and many strands of colorful ribbon. The pink polyester shirt is a common collared shirt with real buttons down the torso and at the cuffs. The black vest has three buttons down the front and straps that tie around the back for a good fit. The vest has a raised floral pattern for depth and elegance. The pants are dark brown with mocha stripes, and you'll get a good fit with the elastic waistband. The tartan pattern half-gloves have elastic at the wrist and a hole for all four fingers as well as a hole for the thumb. The bowtie is black with colorful polka dots, and ties easily around the neck. You're sure to have the most realistic Alice in Wonderland costume anyone has ever seen.